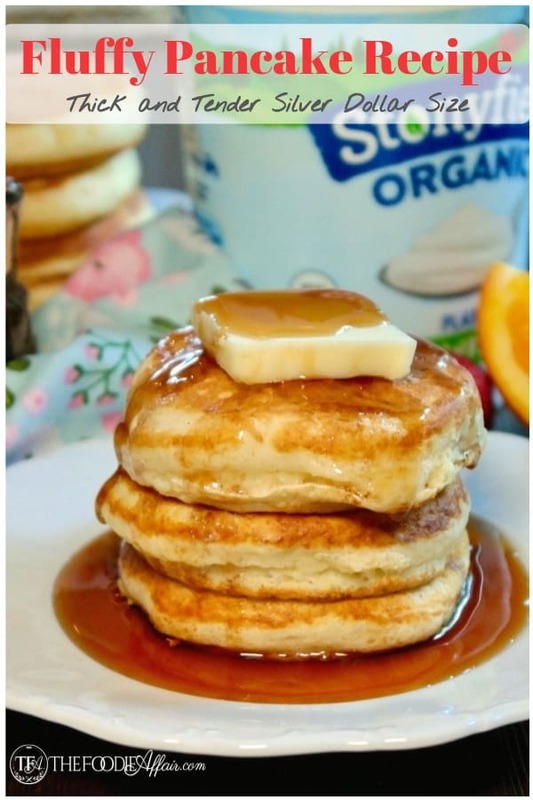 Fluffy pancakes silver dollar size with yogurt for an extra boost of protein! 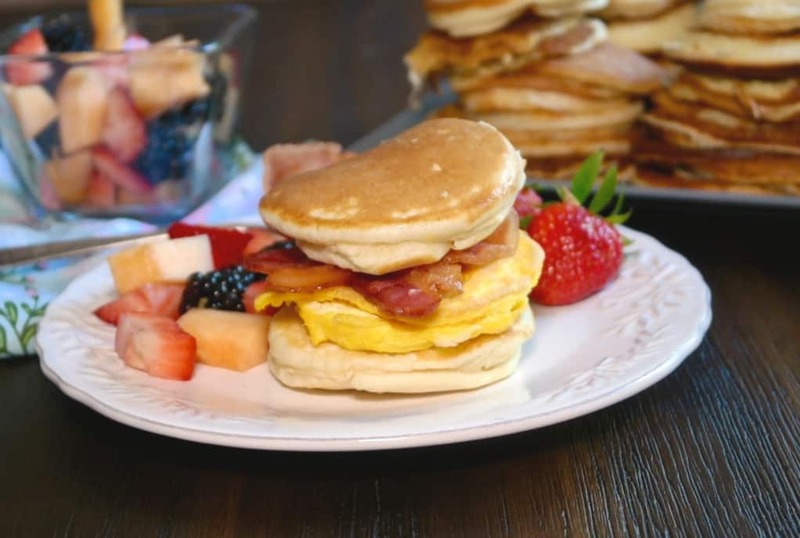 Try this hotcake recipe with syrup or add bacon & egg for a sandwich! 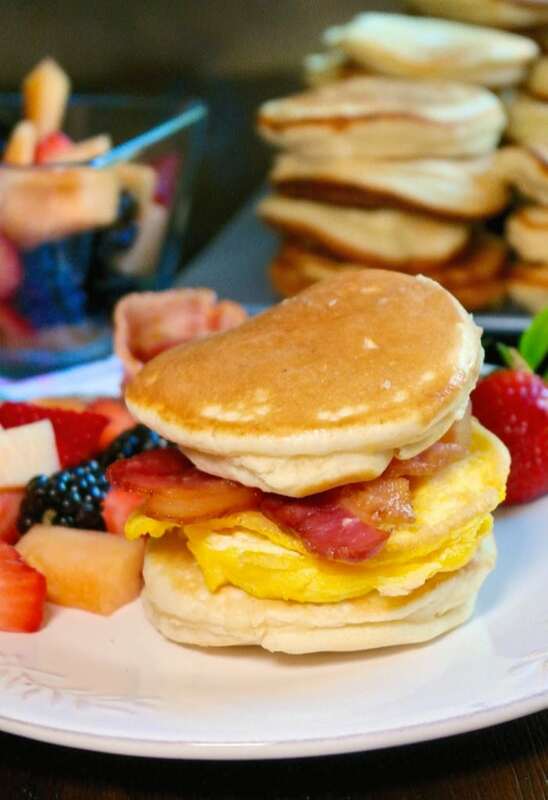 We are finishing Easter brunch week with a stack of the best pillowy pancakes ever! That was the vote from my family, so now I want you to put these babies through your own taste testing methods. 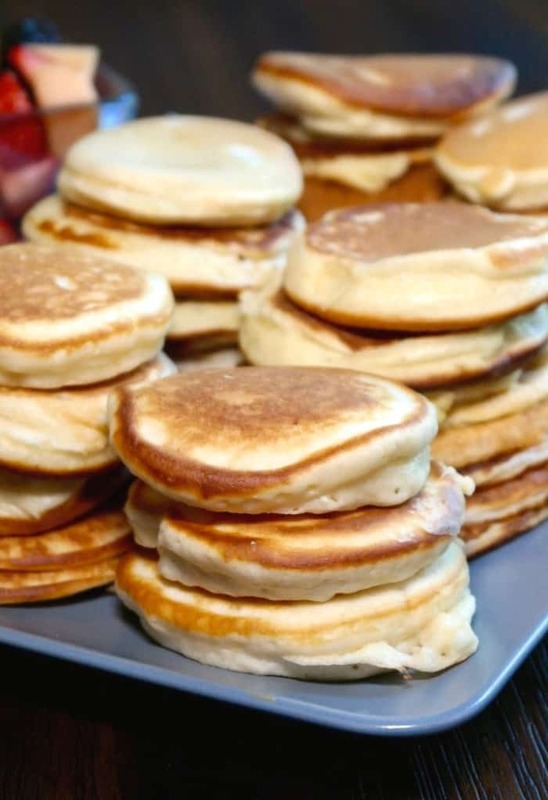 These pancakes are silver dollar size, which in my opinion is the best size for kids and for brunch because a brunch menu has lots of options to choose from, and I want a bite or two…or three of everything! First you want to whisk the dry ingredients together and set this aside. Next, place the wet ingredients in a blender; egg milk vanilla, oil and yogurt. Pulse until combined. For this next step mix the dry and wet ingredients together in the blender, but only one or two pulses. DON’T over mix. OR add the wet ingredients to the dry ingredients and mix in the bowl. Again, DON’T over mix. Otherwise you will break down the gluten and won’t get the fluffy pancakes like you see in the picture. Also, make sure that the leavening you use, baking powder and soda has not expired. If you use old ingredients then you will get very flat pancakes. Once the batter is ready prepare the Nordic Ware silver dollar pan by lightly greasing each cavity and heating the pan to medium. Next add two tablespoons of batter to each cavity. The batter is thick, so spread it with the back of the spoon filling each cavity in the pan. Cook until bubbles form and the pancake is firm enough to flip over. Flip the pancake and cook the second side until lightly browned. Get creative with the pancake toppings! What do you like to top your pancakes with? Alan grabs the peanut butter with syrup….every time. PB and maple is a delicious combination, but my favorite is this sugar free strawberry topping or this pecan maple syrup! Oh, and this coconut syrup is another tasty topping for pancakes. You guys, I was thinking that this silver dollar pancake pan would have been perfect for when my kids were little. 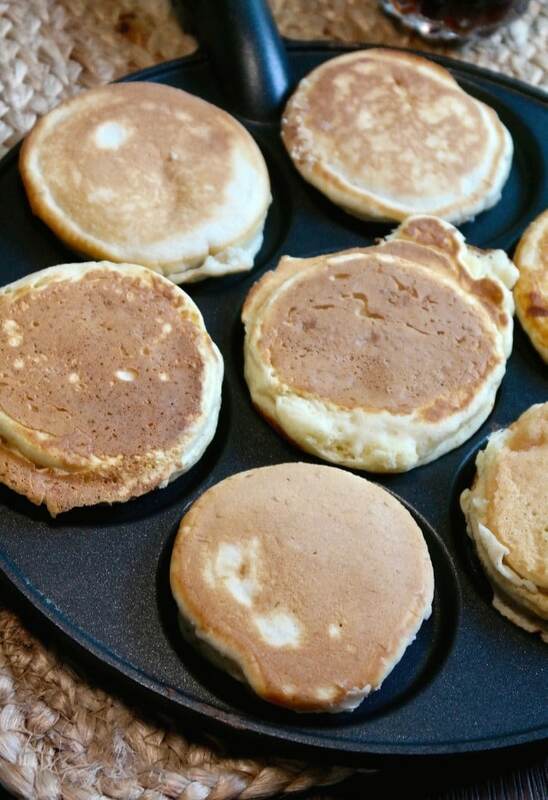 Little tummies and little pancakes are just too cute. Then I thought, this is a good size for ME! Actually, it’s a great kitchen tool for anyone because those little cavities can be filled with other ingredients too. I cooked a gooey delicious egg on the side for Alan. Then I scrambled some eggs and made pancake sandwiches! The pancake sandwich (with bacon) was my son’s favorite way to eat these pancakes. Grab ‘n go meals are always a hit! Plus, they’re super filling! 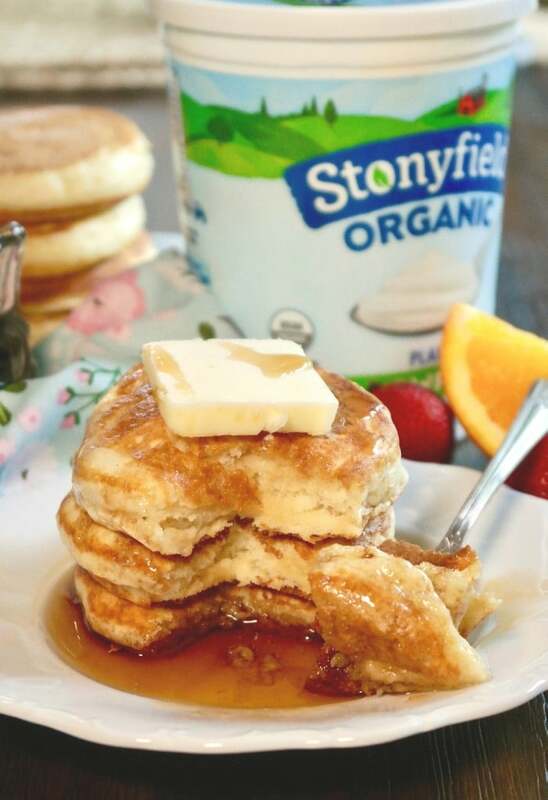 Not only is there a dose of protein in the pancakes from the Stonyfield Organic yogurt, but the egg and bacon add an extra boost of protein too. Cornbread & Sausage Pancakes – Pieces of sausage right inside the batter! Mini Pancakes with Raspberry Sorbet – Topped with chocolate for a decadent dessert idea. 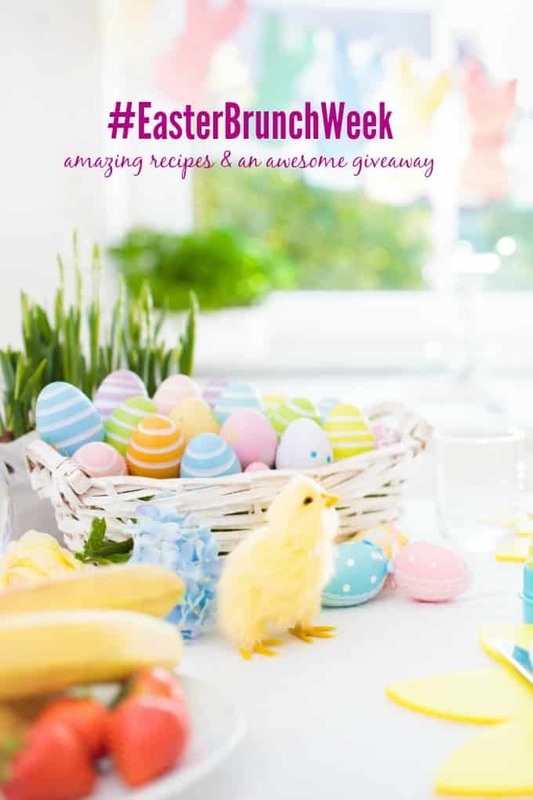 Don’t forget to enter the giveaway below! I really, really want one of my readers to win. Fingers crossed! Silver dollar size fluffy pancakes with yogurt for an little extra boost of protein to help keep you satisfied. Enjoy with syrup, jams or layer with egg and bacon for the ultimate breakfast! In a blender add egg, yogurt, milk extract and melter butter or oil. 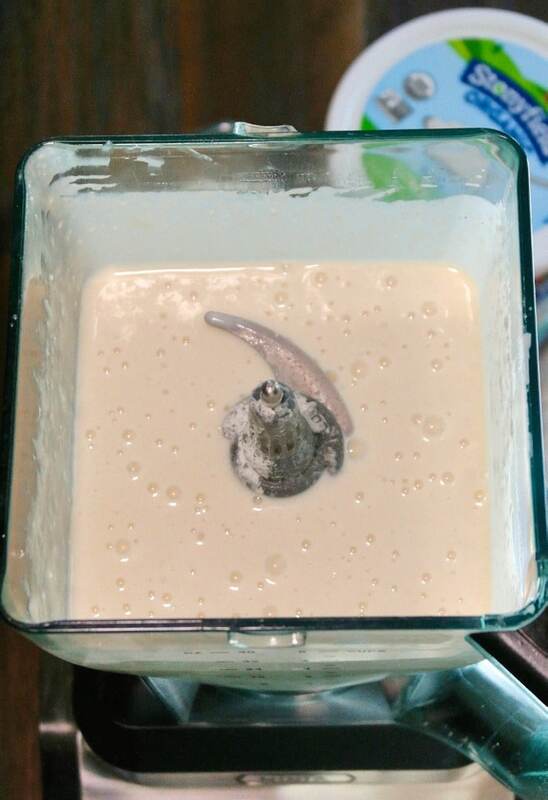 Add dry ingredients and blend until smooth. 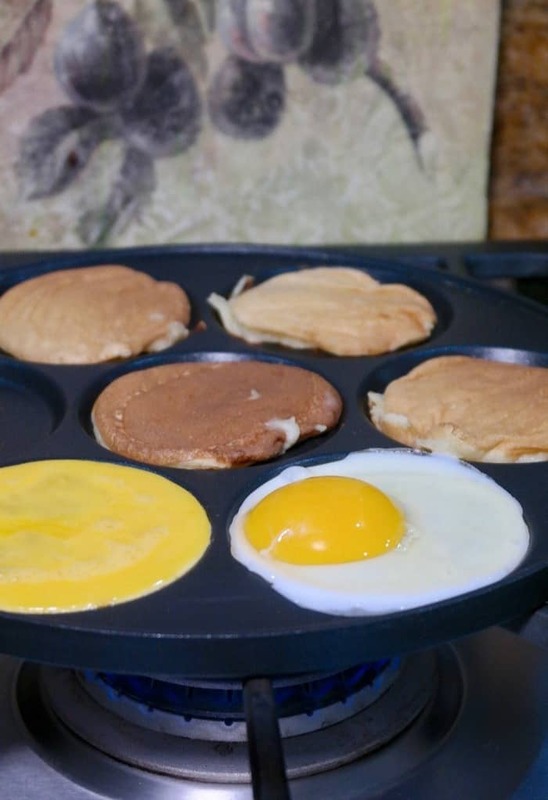 Heat silver dollar pancake pan over medium heat and lightly season with butter or oil. 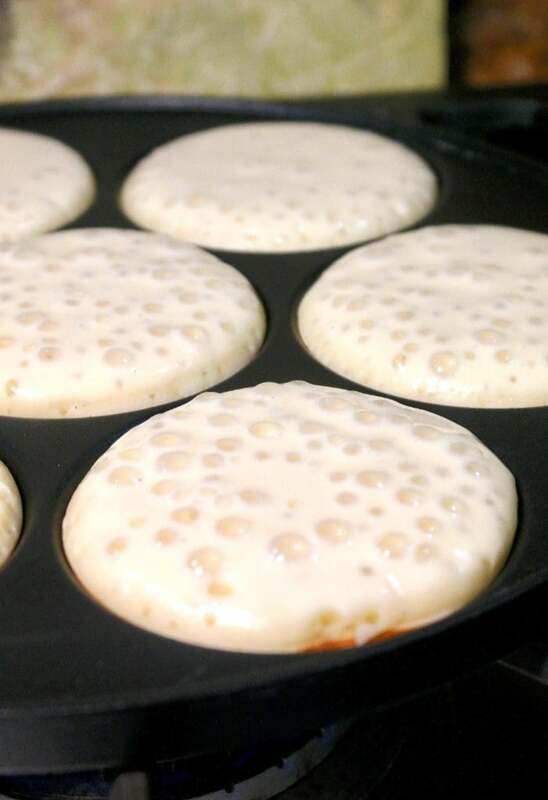 Spoon two tablespoons of batter into each cavity of the pan and cook until bubbles form. Turn each pancake over and cook until light golden brown. We always do a waffle bar for Easter brunch! These pancakes look amazing!! Yes please! 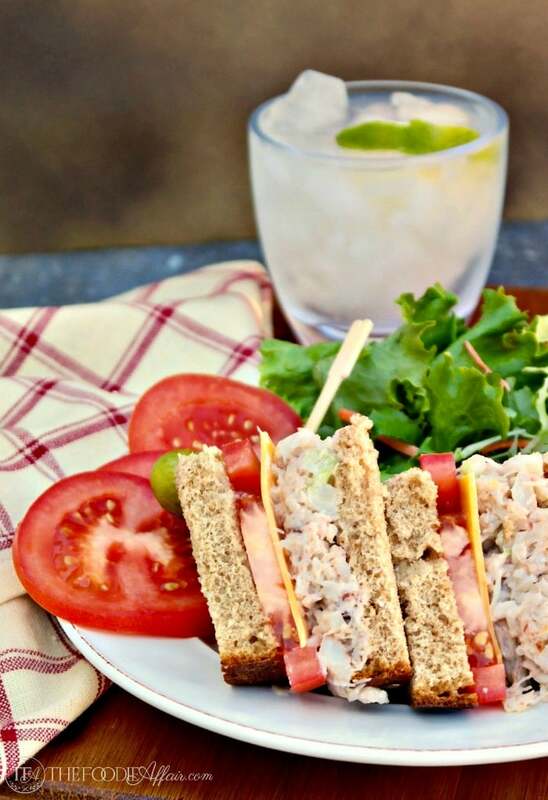 This looks so delicious and I can’t wait to try it out! I love the breakfast sandwich you made with the silver dollars and egg- I can’t wait to give it a try! These pancakes are so cute! They remind me of a remind me of a diner we used to go to when I was a kid. I Need to get that pan! I like the pan a lot! You always get the same size of pancakes all the time and I love how easy they wash up. I love to eat pancakes but I never cooked them, but I was very curious to start preparing them and this recipe is simply perfect. Thank you!